The Guardian has decided that Obama is electioneering, and his only reason for sounding pro Israel is our old friend the Jewish Lobby. The president’s speech was as much about the politics of his own re-election bid next year as it was about the politics of making peace. Read his analysis, and despair. If I was an anti-Semitic despot desperately trying to cling to power and I wanted to give an interview with pliant Western journalists to make propaganda, I know that Jeremy Bowen would be at the top of my list. It came as no surprise to me that Mr Bowen was one of the three journalists that Colonel Gaddafi chose to interview him. This said, in my cursory viewing of the interview, I would say that Bowen successfully maintained plausible deniability that he was acting as Gaddafi’s shill, if indeed it would be fair to construe that that would possibly be his intention. In what I heard of his reports thereafter there was nothing that really stood out as that untoward. Until recently. As the ‘madman in the kaftan’ has rallied his forces and appears to be gaining the upper-hand over the rebels despite major defections and allied bombing, there has been a decided shift in the BBC Tripoli Correspondent’s tone of coverage. Round about this time I noticed Bowen refer to Gaddafi’s side as ‘Libya’, although he quickly corrected himself straight away. Bowen is clearly self-identifying with Gaddafi. I had to wait some time in to the interview to confirm that by ‘Libya’ he actually meant the Gaddafi regime. The lingua franca of covering this conflict is ‘loyalists’ and ‘rebels’. While Foreign Secretary the Rt Hon Wiliam Hague MP has announced that Her Majesty’s Government no longer recognises the legitimacy of Gaddafi’s regime for the murderous brutality with which he has suppressed his people’s quest for freedom, Bowen clearly wants to confer legitimacy on Gaddafi in the minds of the British public. Why would Bowen do this? My contention, or supposition, is that he sees there is a very real possibility that if Gaddafi is toppled Libya will have a Government that does not share Bowen’s pathological hatred of Israel. Such a thing for Bowen would be enough to give him a coronary. If you listen to the whole of the interview you’ll see that overall Bowen does enough to maintain a veneer of impartiality – enough to seduce the unsuspecting listener into trusting him so that he may steer their unsuspecting minds to where he wants them to go. Although you might consider, as I do, that he was deftly trying to rubbish a rebel supplied casualty figure without having any idea what they’d been based on (Some idea here). One occasion however when Bowen’s facade dropped spectacularly is etched vividly in my mind. During Gulf War I a cruise missile struck a civilian bunker in Baghdad leaving hundreds dead. David Dimbleby interviewed Bowen live from Baghdad. Bowen reported in terms of ‘aren’t we bad, we really need to stop this war as soon as possible’. Bowen was livid that Dimbleby had got in the way of him promoting Saddam Hussein propaganda. There is no anti-Semitic tyrant that Bowen will not shill for. Unfortunately, Mr Dimbleby chose not to pursue the matter further, apparently wishing to avoid any further unseemliness from his deranged colleague. As all the experts have told us, imposing a no fly zone on Gaddafi is an act of war. We are at war with Gaddafi. If Jeremy Bowen keeps heading the way he’s going he risks supplying enough grounds to the security services to place him under formal investigation for aiding and abetting the Queen’s enemies at time of war. Given that Her Majesty’s Government has stretched Her already overstretched armed forces still further with the much needed action against Gaddafi to stop him massacring his own people for seeking freedom, not to mention the unfinished business of WPC Yvonne Fletcher and Lockerbie that must rightly underlie our action, it might be hoped that if Mr Bowen does take that ill-advised step too far, the P45s awaiting our heroic servicemen upon their return may be cushioned somewhat by the long overdue spectacle of HMG taking action against Treason. Hopefully, our Prime Minister would not feel the need to ask Shami Chakrabati’s permission to do this, or is our country so far into its death throes that this might not be such an absurd notion? Treachery, seek it out. He’s still blinking. Caught in the headlights in Tripoli, I think he has suddenly woken up! He’s telling us that the rebels in Libya might not be all they’re cracked up to be. And despite all our efforts, Gaddafi. Aint. Bovvered. Meanwhile Orla Geurin has gone to the intensive care department of a hospital to emote about civilian casualties inflicted by Gaddafi’s army. I’m always suspicious of broadcasts from hospital wards, especially those direct from intensive care. While the BBC is trying to get us onside in the war against Gaddafi, Bowen is warning us that we should give some consideration to the ‘better the devil you know’ theory. Just to be clear, I’m ambivalent about our involvement in Libya. But that is neither here nor there. When the BBC is overtly campaigning for something I automatically become suspicious. Is this really me, or have I metamorphosed into someone else. …. because I’m wondering if Jeremy Bowen has suddenly ‘grown a pair’? Attacking Israel with malice aforethought is one of this country’s favourite pastimes. From grave political misrepresentation emanating from MPs and broadcasters, to gossip and urban myth perpetuated by press, television, journalists and chatterati. For example, a misdiagnosis of the PaliLeaks revelations is firmly embedded in public consciousness. Despite being filtered through sources with infamously anti-Israel agendas – the Guardian and Al-Jazeera – the consensus is that the Palestinian negotiators were weak, cravenly offering everything to the swaggering intransigent Israelis. This interpretation sabotages the PA, the peace process and damages Israel’s image even further, if that is conceivable. Without taking the trouble to ask themselves cui bono, who benefits, they adopt this theory and stick with it. Go Figga. Swallowing this interpretation has a prerequisite., which boils down to believing that Israel is simply wrong. Wrong to defend itself, wrong to be Jewish and wrong to be in Muslim Lands. Imagine, if you will, that Israel’s deputy foreign minister was a nice chap. Imagine that he applauded what the Egyptian people have been striving for. Imagine, as if your imagination was huge and boundless, that this man was Danny Ayalon, and you saw that he was good, and fair, and personable, and without a nasty foreign accent. Then suspend your disbelief, and with a gigantic effort imagine that John Humphrys didn’t interrupt this, this, this…silver-tongued trickster. This is getting too much. Snap! You’re back in the room. Here comes Jeremy Bowen. He couldn’t believe it either. “Of course you’re getting a partial view” he spluttered, because he hadn’t got a leg to stand on. Imagine! Jeremy Bowen accusing someone of having a partial view! No, not really. Jeremy Bowen simply believes Israel is wrong. Wrong to defend itself, wrong to be Jewish and wrong to exist. MUSLIM BROTHERHOOD TO RECORD "KISSES FOR ME"? Comments Off on MUSLIM BROTHERHOOD TO RECORD "KISSES FOR ME"? Sometimes, when I hear Jeremy Al Bowen talking about “the Brotherhood” I wonder if he has in fact mistaken the Egypt based bunch of Jew-Hating Islamic supremacists for the Eurovision winning Brit group of the 1970’s? I listened aghast to an interview with Bowen on Today this morning (7.50am) with Bowen once again sanitising the Brotherhood to such a degree that one could hardly imagine any downside from such a “conservative” group of kindly men. The BBC is doing all it can to portray what is going on in Egypt as a wonderful example of spontaneous people power, democracy in action. It seems entirely unconcerned about the vicious anti-Semitism that characterises the Brotherhood. How odd. 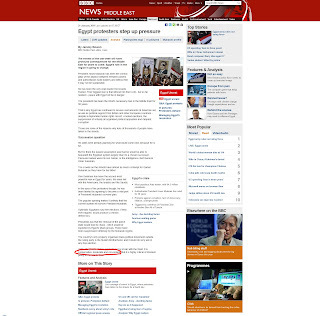 I’m sure B-BBC regulars trawl roughly the same blogs, and I often recognise familiar monikers on comments pages. Grant wonders about the BBC’s lack of interest in Tunisia now that their uprising is old hat. I’d say it was a bit premature to hold it up as some sort of role model for the rest of the Arab World, though. Elder of Ziyoners will know what I mean. Hat Tip to Hippiepooter for linking to this interesting thread from Harry’s Place. I actually saw Jeremy Bowen say those words, and he had a distinct smirk on his face as he said them. The Muslim Brotherhood is certainly not moderate, and as we already know, the BBC interprets *conservative* in its own unique way, but non violent? Pull the other one. All BBC reporters seem to have taken to referring to Hezbollah and Hamas as “Regarded by Israel as a terrorist organisation.” (But not by anyone else, impliedly.) Soon they’ll be applying it to Al Qaeda. I think they would like to see the British people prepare, not only for a war against Israel, but also for a losing battle against Islam. As we have been commenting for the past several days, “ace” BBC correspondent Jeremy Bowen has been going out of his way to allay any fears the British public may have concerning the rise to power of the Muslim Brotherhood should Mubarak fall in Egypt. The question is – WHY would Bowen (and his employer) seek to convey this impression? Well, here is one suggestion..
Israel’s threat is Al Bowen’s opportunity? Surely not…. occupiedterritoriesillegalunderinternationallaw have been given to them by God. The BBC sets out to show that the negotiations have been scuppered solely by Israel’s refusal to extend the moratorium on building within Jewish settlements. The BBC deliberately gives the impression that this involves extending Jewish territory and contracting future Palestinian territory, when the truth tells quite a different story. 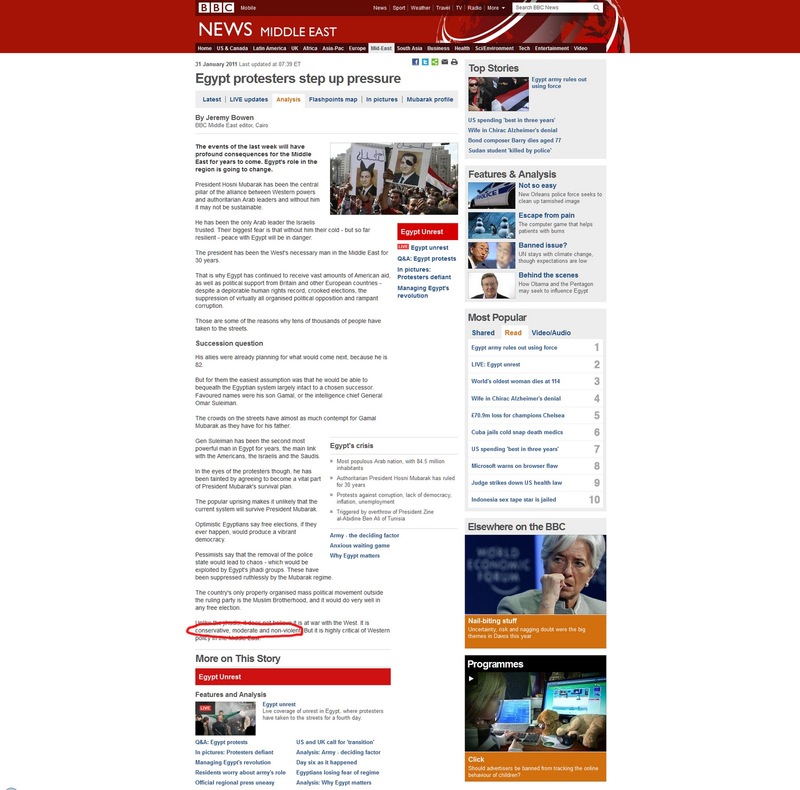 The anomaly regarding the religious connection to the area, (apparently ridiculous when expressed by Jews, but acceptable and incontrovertible when applied to Muslims) doesn’t seem to have struck the BBC. Bowen portrays the Palestinians as if they were a genteel team from an English village protest group in a tussle with some fanatical Jewish zealots, armed to the teeth and bristling with aggression, over a bit of stolen property, when the reality is nearly the reverse of that. Their David is really Goliath, and their Goliath is radical Islam. The BBC doesn’t want us to think of Israel as a liberal westernised democracy whose struggle for survival is seriously threatened by followers of Islam with its attendant duplicity and inherent antisemitism; not to mention being surrounded and outnumbered by the enemy and vilified by the BBC and therefore the rest of the world. Anyone catch this report from Jeremy Al Bowen as he strolls around the streets of Jerusalam to “find out the mood of the public towards continuing peace negotiations”? Bowen parrots the Palestinian demand that Jerusalem must also be it’s Holy City (as much as it is Israel’s) if there is to be peace – this equivocation is so ludicrous only Bowen could make it. If Palestinians wanted a publicist who can always be relied upon. Al Bowen fits the bill. I wonder did he wear a Keffiyeh when he filed his report? Comments Off on Let’s Call the Whole Thing Off. Constant repetition of a word or phrase can transform it from eloquent to hollow. However perfectly it encapsulates a situation, over-use will render it meaningless. Trotted out over and over again, words like vilify, delegitimise, illegal war, international law, apartheid, and many more, lose their impact; particularly when they’re bandied about willy nilly by people who have no idea whether what they’ve said is justified, appropriate or the truth. Peace activist, humanitarian aid, war crimes, obstacle to peace, Palestinians. Nazi. Fascist. Neocon. We’re all trapped by these words. We say antisemitism, you say Islamophobia; we say terrorist, you say religion of peace; we say Islamic, you say unIslamic; we say legitimate, you say illegitimate; we say Israel, you say Zionist entity; we say biased, you say balanced. Tomato, potato, potahto, tomayto. Let’s call the whole Jeremy Bowen off. From Our Own Correspondent, fully transcribed online, so you don’t have to listen to the lisp or behold the glistening brow. The BBC’s chief Middle East Editor expounds on the rift between Netanyahu and Obama, between Israel and America. There are certain things only your best friend will tell you, Bowen opines. Being a little cruel to be kind, Obama whispers gently to his good friend that he’s not standing for much more of this Jewish lobby malarky. The Jewish lobby’s convention centre in Washington DC is bigger than.. than… than …. a football pitch, Bowen declaims. No! several football pitches. That’s how powerful the Jewish lobby is. Not for much longer though, he speculates. Impertinent Netanyahu with his lectures on the Arab-Israel conflict, his deliberate insults to the VP, his Homes for Jews in occupied Palestinian territories illegal under international law, and his attacks on innocent Turkish peace activists. Jeopardising peace on earth, provoking the Muslims with his pesky Israel. This can’t go on, Bowen predicts. No more Mr. nice guy. That’s what will happen; verily I say unto my listeners. Jeremy Bowen and his ilk have coined a whole lot of phrases, some of them have become meaningless, and some were meaningless in the first place. Without a hint of self-examination or self awareness the BBC happily lets the middle east editor insinuate about powerful Jewish lobbies. No sign nor hint of a recognition that the BBC is itself an enormous great lobby. The size of… of…. of… thousands of football pitches. It is not a good day at the BBC if they can’t snipe at Israel and so it is that B-BBC stalwart Jeremy Al Bowen does his usual routine here As ever the language is so loaded and dripping in anti-Israel sentiment that Hamas would struggle to be less biased than him. It’s outrageous the way the BBC foists this biased coverage of all matters Israel upon us.